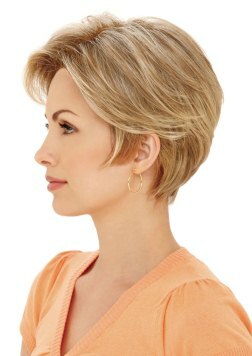 Charlotte is from Estetica's Naturalle Collection and is a short wedge cut with voluminous top and long bangs. This wig has a ready to wear invisible lace front hand stitched hairline. No glue or adhesives needed. This means its made with a special type of transparent mesh material with gives the appearance of natural growth. The sides and back are machine wefted and give a breathable comfortable fit. Adjustable hooks help you get the best fit for you. Bangs: 6" Crown: 6.5" Sides: 2.5" Nape 2.5"